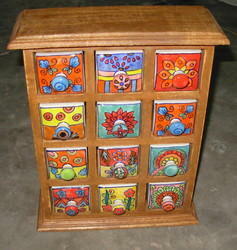 These beautiful hand-painted ceramic drawers in a wooden box are perfect for several uses. These can be the highlight of the living rooms, office space, kitchen or even dressing tables. 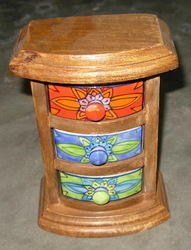 You can store spices, jewelry, stationery or even things like nails or buttons! 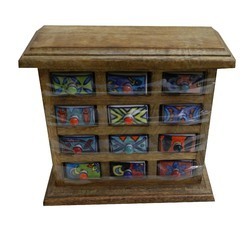 Very adequately prices for this great quality, beautiful hand-crafted and unique wooden box. Each piece has been loving adorned with beautiful designs and has a great quality finish. Being a leading manufacturer and supplier in the demanded market, our organization is offering supreme quality Wooden Ceramic Drawers. The offered drawer is widely demanded in various home and official complexes for easy storage of stationery or jewellery items. As well, our wooden drawers are checked in terms of quality before the final dispatch. Best suited for use as a corner table or bedside, it is perfect for any room. Being a leading manufacturer and supplier in the demanded market, our organization is offering supreme quality Wooden Drawers. The offered drawer is widely demanded in various home and official complexes for easy storage of papers, files and other compact items. As well, our wooden drawers are checked in terms of quality before the final dispatch. Best suited for use as a corner table or bedside, it is perfect for any room. 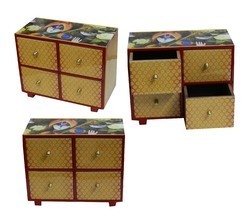 To gain strong foothold in this industry, we are devoted to offer a wide gamut of Antique Ceramic Drawer. Our offered drawer is designed using optimum quality ceramic and cutting edge technology, under the supervision of skilled professionals. To ensure its quality, experts test this drawer against various quality parameters. Our offered drawer is compact in size, lightweight and easily portable. The provided range can also be custom designed as per the requirements of the clients.